Discover Easy Movement and Pain Relief is a complete program for learning how to move easily, and recover from pain or injury. Six easy to understand Awareness Through Movement lessons emphasize the value of being gentle in how you move and how you feel and think about yourself. As you follow Deborah's clear instructions, you will discover new connections between your pelvis, head and spine. You will learn to sense your breathing. Pain is often a result of how you are moving. Learning to sense your whole body in simple movements improves your awareness and you will find this improvement carried over into your daily life and activities. These lessons are ideally suited for beginners or for recovering from pain or injury. Used by many clinics and practitioners for 'home programs'. 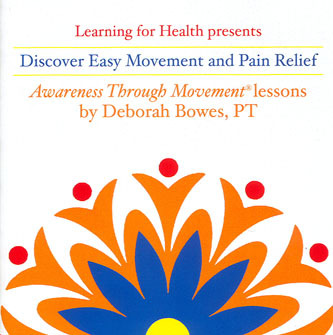 The Discover Easy Movement and Pain Relief program was developed by Deborah Bowes, PT, for the injured workers at the Delayed Recovery Center of the Occupational Health Clinic at Kaiser Permanente in San Francisco where she worked as Director of Somatics. Deborah's Awareness Through Movement lessons have helped hundreds of people feel better and move better and can help you, too. 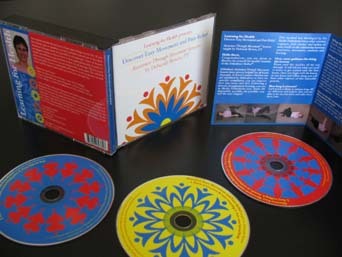 6 lessons on 3 CDs: Price: $48.00. Gentle coordination of your shoulders and hips. Read Deborah Bowes' article on the Feldenkrais Method and Chronic Pain. Click on the link to read about our other CD programs for pelvic floor health, repetitive strain injuries and more. Click on the link to read our articles on pelvic floor health, repetitive strain injuries and more.